We continue to acquaint you with the lessons of drawing characters from Tokyo Ghoul. 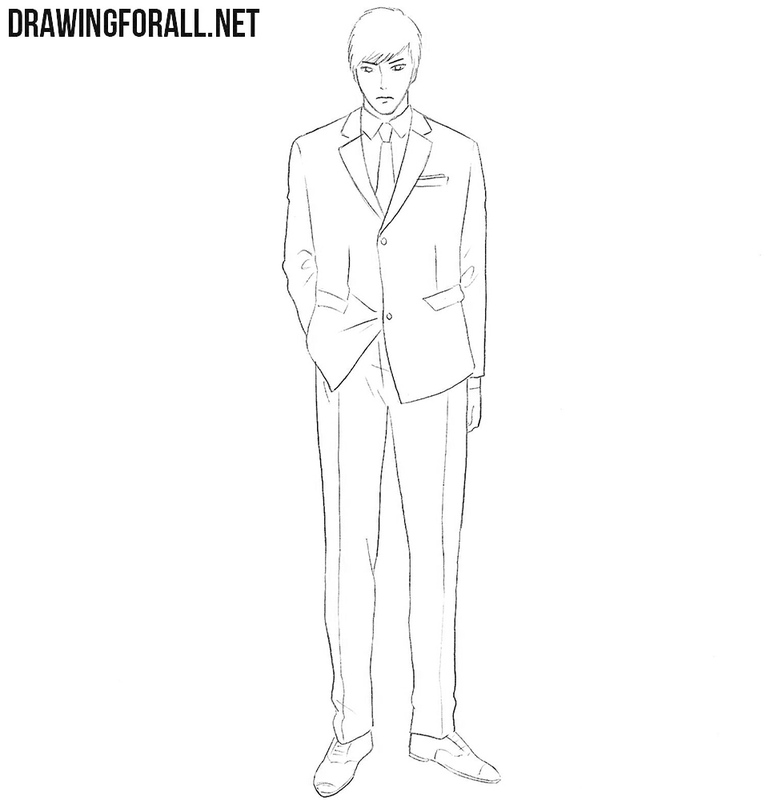 And in this very drawing guide, we will show you how to draw Koutarou Amon. If you are an anime fan, you probably know about this dark, stylish film. If you do not like anime at all, then you can just practice drawing male figures in strict business suits. Let’s start it with the stickman (actually a skeleton, blank of the future character) of Koutarou Amon. At first we sketch a head in the form of an oval (or an inverted egg). After that we outline a long line of the spine. On this line, we sketch the chest and the pelvis. And at the very end of the step number one we sketch out the limbs using the simplest lines. Now it’s not very noticeable that we draw an anime character, is it? We will work for it a little later. And in this step we draw two crossing lines inside the outlines of the head. 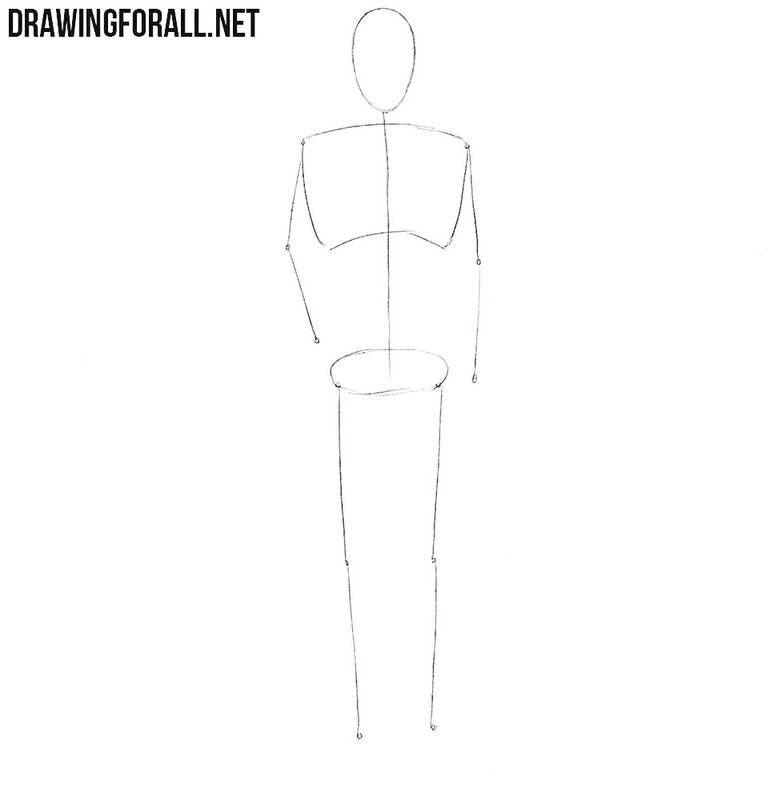 It will be a great guide when we will draw the face. After that we sketch out the neck in the form of a cylinder. Connect the chest and pelvis with the help of light lines forming the contours of the body. Then we can sketch out the shoulders and arms with simple geometric shapes. Now let’s work with the basic details of the face. First of all sketch the eyes being guided by the line of symmetry drawn in the second stage. Then sketch the nose and mouth on the vertical line. Next outline the hair of Koutarou Amon as you can see in our picture. Also in this step we sketch out the general outlines of the elements of the classic suit. This clothing should look slightly slim. Using clear and dark lines, carefully draw out the contours of the jaw and the details of the face. 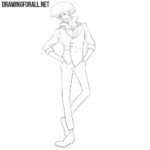 If you want to know more about how to draw anime faces, then visit this article. Next, outline the contours of the hair and face. After that you can remove all the guidelines that we have drawn on the head. 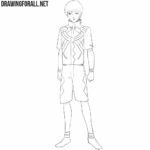 Continue the article about how to draw Koutarou Amon. It’s time to work with the details of the body. So in this step we are going to draw the details of the classic suit. Carefully draw out the outline of the shirt, jacket and slim elegant tie. 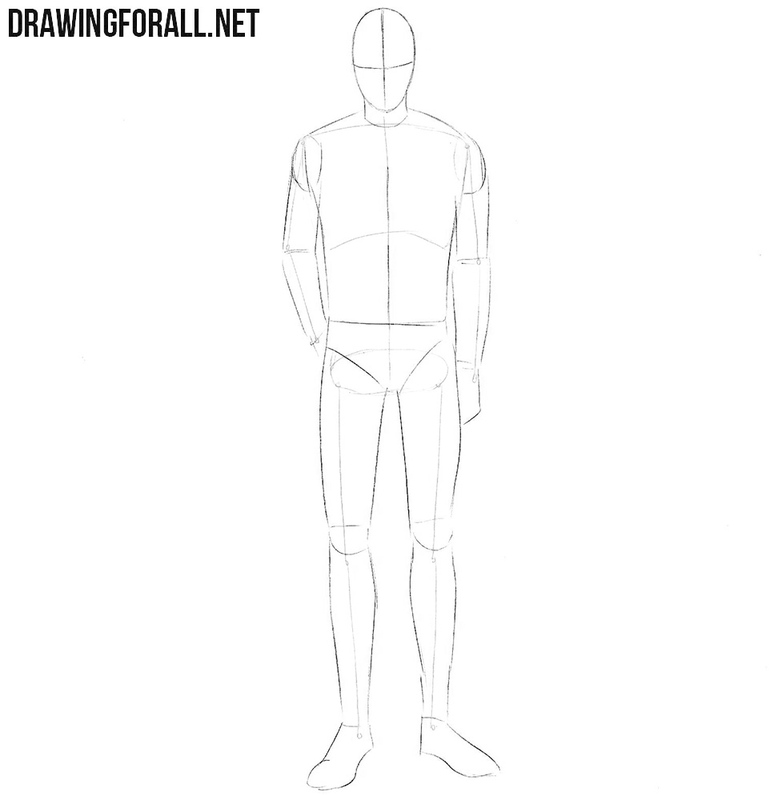 Draw the folds with the help of short neat lines. 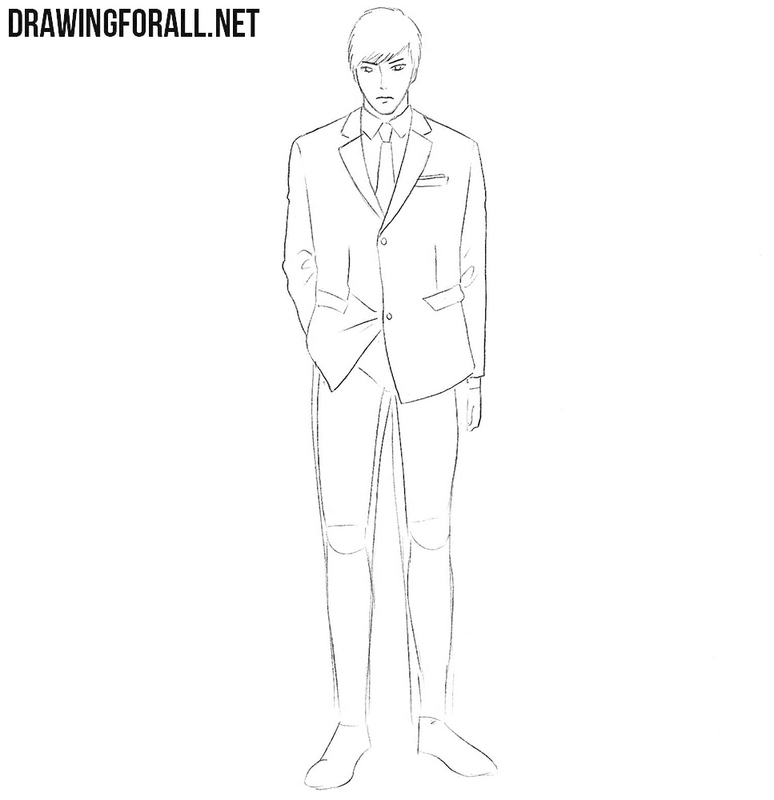 In this step we will draw the sleeves of the blazer. You can see some folds which are located in the places of compression and stretching of fabric (for example near the cubital fossa). These folds look like horizontal or oblique rounded short lines. Also draw the visible part of the hand. In this step we will draw out the pants of our anime character. As before, here we need to delineate the contours of the pants by confident hand movements, taking into account all the folds of the fabric. Draw the contours of the shoes and details on them. Remove all the remaining guidelines. 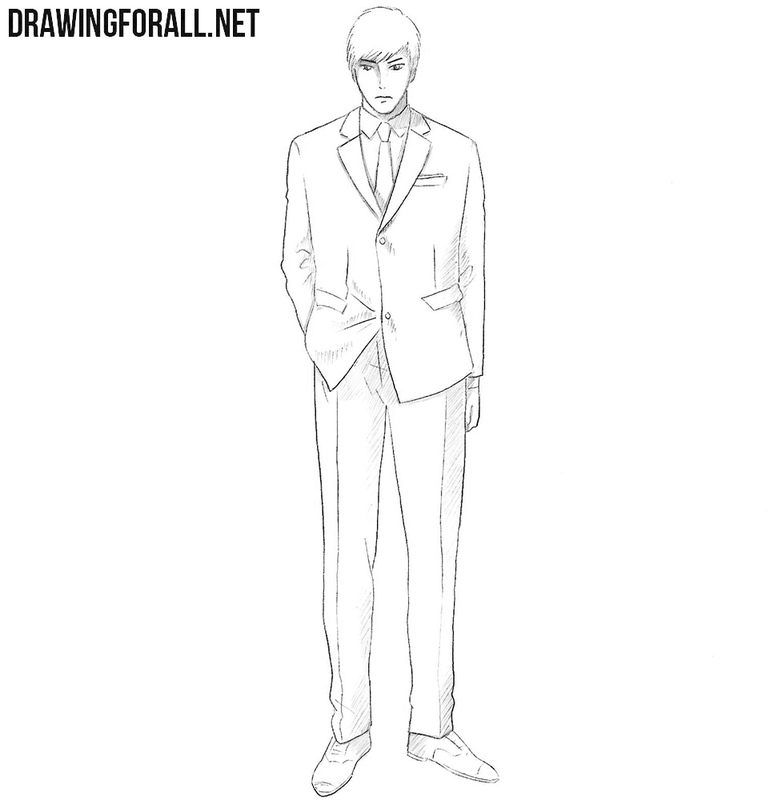 The lesson about how to draw Koutarou Amon is practically completed, so we need only to draw some shadows. Using light hatching add shadows in areas where the light does not fall. You can make some parts of the costume darker according to your wishes. Do not forget that you can add more layers of hatching, this will make your drawing more natural. We hope you like this drawing lesson. You can help us – just share this drawing guide with your friends. Please, do not forget to subscribe to us on social networks (for example Pinterest, Google Plus and Facebook), and write your opinion in the comments below this article. 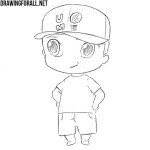 And also, if you like manga, then definitely go to the category called “Anime” on DrawingForAll, because there we have a huge range of different drawing lessons about characters from anime and manga, as well as a lot of lessons about cute chibi characters. As we wrote above, this lesson can also be used to draw an ordinary man, such as a businessman or an insurance agent. The fact is that the proportions of anime characters differ little from the proportions of an ordinary person. 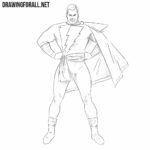 You can also slightly change the appearance of the character, “dressing” him in other clothes, or drawing him from a different angle or in a different pose.